How to Import to Kenya? Detail the import methodology in Kenya. How to import to Kenya? 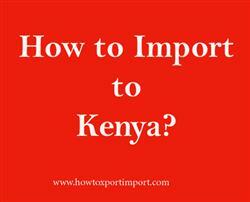 What are the import procedures in Kenya to move goods? Explain about import registration process, cargo movement to Kenya from overseas countries, Import delivery process in Kenya etc. This post explains about step by step procedures that need to be finished with Kenya government authority for importation to Kenya. All natural persons or legal entities are approved to conduct export and import process in Kenya. But a registered trade with concerned license as per the business is must for exporting and importing of commercial products from and into Kenya. The Customs Services Department of the Kenya Revenue Authority (KRA) is the official customs authority of Kenya. The function of the Department is to collect and account for import duty and VAT on imports, facilitation of legitimate trade and protection of society from illegal entry and exit of prohibited goods. The import documents required in Kenya depends up on the regular trade policy of Kenya Government, the nature of goods importing, specific goods importing to Kenya. The importer should make sure that they made all of the correct import documents that are required to get clear the customs formalities, satisfy all compliance and regulations. Any delay in filing or absence of documents can delay the clearance process and thereby importer supposed incur demurrage on the imported cargo but also stand to loose business opportunities. This post explains about different phases in import process that every importer needs to go through in Kenya. Procedures required to import to Mombasa. Requirements to import to Eldoret. Clarifications to import to Nairobi. How to import to Nairobi? Formalities for import to Kisumu. Procedures to import to Mombasa. Need to import to Eldoret. Explain to import to Nairobi. Information to import to Kisumu. Step by step process to import to Mombasa. Methods to import to Eldoret. Guidelines to import to Nairobi Please guide to import to Kisumu. Help to import to. How can I import to Kisumu. What should I do to import to Mombasa. How to import to India from Kenya? How to export from India to Kenya? How to export from Kenya? How to import to India from Monaco? How to Import to Monaco? Who is a Tax Return Preparer (TRP) under GST in India? How to export from India to Cuba? How to export from India to Italy? How to check the time of contract on high sea sale transaction?